PIZZA STONE home decor, jewelry, decor, decorations, electronics, fountains, floor mats, art glass, vases, garden essentials, fireplace screens. 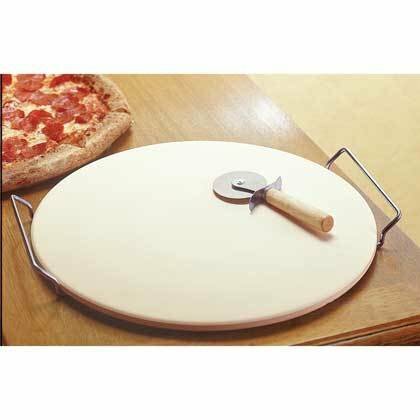 For the pizza-loving household, a 15" diameter pizza stone for easy pizza cooking, slicing and serving! Comes complete with stainless steel rack and pizza wheel. Material(s): STAINLESS STEEL CERAMIC HIGH TEMPERATURE CERAMIC. Weight 4.96 pounds. Dimensions 15" x 15" x 0.4".